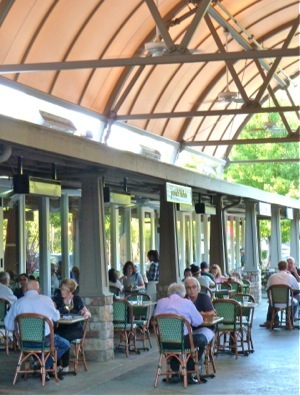 One of the best-kept secrets for those who live in west Menlo Park is how pleasant it is to dine outside during the summer at Ladera Country Shopper on Alpine Road. The dining scene has evolved there over the past couple of years with a Lobster Shack opening in the space once occupied by a deli and the addition of Amigos Grill. Earlier this year another restaurant, Mike’s Cafe, closed, promising a transformation in a space that had gotten tired and food that had gone from predictable to not-so-good. It re-opened a week ago as Portola Kitchen, and we decided to make a visit. What’s the same: Still a great place to eat out-of-doors. There are both fans to move what can be hot summer air around and heaters to warm diners up, as needed. The new menu features moderately-priced dining options, at least by mid-Peninsula standards. And the crowd continues to be a mix of families as well as locals, including those from the nearby Sequoias retirement complex. What’s new: The interior is more modern and light. The open kitchen remains, but is more visible. And the menu offers rustic Italian food, with pizzas and for from run-of-the-mill pastas. Entrees include a variety of fish to fowl to red meat options. Bottom line: it’s a welcome addition to west Menlo dining options. Wow! Apparently this author doesn’t really know food and wine. It is really irritating to me that just anyone can act like a food critic these days and publish whatever they want. This is a very poor assessment of the new Portola Kitchen venue and dining experience. One of the most welcome new trends in food – Rustic Italian with everything made fresh in house (pizze dough, bread, sausages, pastas etc.) is incredibly well represented by this beautiful venue in the foothills. Also I hear they are using fresh produce locally grown at Webb Ranch and I certainly support that! The wine and cocktail list wasn’t even mentioned by this author and I found them particularly impressive. My friends and I who have enjoyed Portola Kitchen several times in the few weeks since they have been opened found this review misleading. It used to be that a few select culinary experts provided guidance to local diners but now anyone with a computer can assume this role. Try it you’ll like it! Love Portola Kitchen! Although Mike’s Cafe was doing pretty well, this new chef and the new menu is current, creative and super fresh. Thumbs up on the cool new ambiance (love the reclaimed woid). Great for dates and parties. Especially enjoyed the live jazz outside over the past two weekends. I am excited about the seasonal menus…more to look forward to. Strongly encourage everyone to book a table as I think this spot is going to be a very popular destination.